Wandering and elopement are among the oldest challenges senior living communities face. In spite of all the solutions they’ve thrown at it, there’s always another story. Some of them end harmlessly. Others, tragically. And it doesn’t help that dementia continues to claim higher numbers of victims year after year, while dwindling numbers of caregivers are confronted with keeping tabs on more and more confused charges. Adding to the mix: residents in assisted living. As mentally “sharp” as they seem to the naked eye, they are a restless bunch. If they’re not fortunate to live in a community rich with activities and healthy distractions, it’s easy to see how and why they might wander off in search of things to ease their anxiety and restlessness. Thanks to brisk innovation and some very smart engineers healthcare companies have managed to lure in recent years, technology is helping to mitigate this age-old problem. In many ways, in fact, it has become an invisible additional arm for shrinking staffs — one that is ever-vigilant, never takes breaks and never gets tired. It’s nearly impossible to report precisely how many people wander off from nursing homes, assisted living facilities and other types of senior living communities every week, month or year. Much of that is because the bar keeps moving on how clinicians define wandering. Some say the number is a lot. Everyone believes one is too many. The Alzheimer’s Association claims that six in 10 people with dementia will wander at some point. Making matters much worse is the fact that too often, they aren’t carrying identification and rarely remember their addresses, or their names. Marie Boltz, MSN, APRN-BC, NHA, director of practice initiatives at Hartford Institute for Geriatric Nursing at the New York University Rory Meyers College of Nursing, shared one statistic with the National Council of Certified Dementia Practitioners: More than 34,000 Alzheimer’s patients wander out of their homes or care facilities each year. “Studies vary on the prevalence of wandering in institutionalized dementia patients, but is estimated that [up to] 24% wander,” according to Boltz. A 2012 study in the Annals of Long-Term Care: Clinical Care and Aging estimated that as many as one-third of nursing home residents and as many as 70% of community-dwelling elderly with dementia will wander at least once in their lives. Which makes all of these dire statistics more profound for the thousands of people in the vendor community dedicated to developing elopement and wandering solutions. When 53-year-old Tech Electronics, a life safety and communication systems company, recommended a resident wandering solution for a community with a memory care wing, the facility initially balked. Two weeks after the company’s initial site survey, one of the residents managed to leave and was found wandering down the road near a car wash.
“Luckily, this resident was found unharmed and the incident swayed the community to install the system,” said systems specialist Steve Becnel. All of the innovations and life-saving devices developed by RF Technologies over the years crystallized for Steve Varga, chief technology officer and senior vice president, during a recent visit to a senior living memory care facility. People who work for companies such as RF Technologies, which develops radio frequency and real-time location service solutions to track and monitor residents, are more sensitive than anyone to the negative “labels” sometimes linked with tracking devices. During the visit, Varga and his team encountered a spritely couple at the community, who said they were happy to wear the company’s wireless code alert protective devices, for the convenience and safety the devices provided. No technology is foolproof. That’s why more and more engineers in the vendor community are focused on situational awareness and on human behavior itself. Consider the case of an 85-year old man with early-stage Alzheimer’s. On numerous occasions, the wheelchair-bound nursing home resident had ambled past a busy reception desk and wandered toward a bank of elevators, only to be spotted by a staff member and gently returned to his unit. His most recent thorough cognitive and functional assessment revealed nothing alarming, much less indicated his wheelchair use should have been restricted, researchers noted in the Annals of Long-Term Care study. Nothing indicated he was delirious, and his medication load was relatively light, including a beta blocker, aspirin and acetaminophen. But six weeks later, the man managed to catch an elevator ride. He soon was found unharmed, sitting idle in his chair on a sidewalk outside the facility, just a few steps from the front entrance. Vendors are keen to drive home the point with customers. 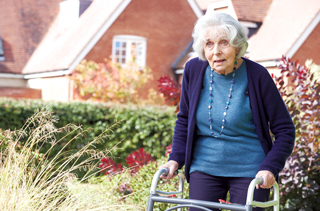 Indeed, ongoing research is uncovering a myriad of new wandering and fall prevention tools based on tacking behaviors. For example, one University of Missouri professor and her team used remote sensor technologies embedded in walls and floorboards to measure gait, behaviors and movements. The technology eventually was refined to reliably predict falls with nearly 90% certainty. One universal truth vendors agree on: Wandering technologies are most successful when residents don’t feel encumbered by them. “The risk is not in the 100 residents who are kept safe and secure. It’s in the one who wanders from the facility and is injured or dies as a result,” Varga said. He adds that more and better-trained staff are “always welcome and should be used to the extent that it may help in making behavioral changes. There’s also the case of alarm fatigue. In so many facilities, from assisted living communities to nursing homes to hospitals, stressed-out caregivers often can become numb to the cacophony of bells, beeps and chirps from myriad monitoring devices. It can lead some to missing signs of an impending elopement. One solution vendors have developed is “silent” alarms, or notifications sent automatically to nurses’ mobile phones when a potential elopement event is detected. Many facilities have had success supplementing wandering tech with environmental tweaks that actually discourage wandering, either overtly or subliminally. The Alzheimer’s Association, for example, suggests placing locks out of the line of sight and camouflaging doors by painting them the same color as the walls, or covering them with removable curtains or screens. The group also advises using childproof knobs or covering them with cloth the same color as the door. Of course, stories abound of senior living communities that enlist architects and designers to build environments with lush gardens and visual stimuli enough to distract even the most wander-prone residents. “Creating living environments that allow freedom of movement, access to the outdoors and even to the degree of ‘perceived freedom to wander,’ are compelling,” Varga said. Homelike environments, combined with tracking and locating technology “can, in fact, provide the sense that one is free to go where they like, but then provide safety precautions that keep the resident from coming into harm’s way,” he added. As old as wandering tech is, many say it is far from being a mature market. That’s because innovation continues to be brisk. Flex, a large contract manufacturer, for example, is experimenting with crops and plant fibers in its zeal to develop a wearable fabric with embedded wireless sensors that are impervious to water, temperature or chemicals. Another company, Impactactive, which designs products to protect hips during a fall, is exploring integrating RFID technology into its garments. The idea came upon designers when they were looking for ways to better ensure compliance as a fall-injury prevention intervention, said Chris Baker, vice president. “I can see this would be a very effective method of notifying the community staff that a resident was in an area they shouldn’t be,” Baker added. “The RFID chips were very easily integrated and were able to be permanently incorporated into the garments to withstand laundering, etc. In the end, no single device or technology will completely prevent a wandering incident. The key, according to Elder, is a holistic approach. “The trend we are seeing is integration of various technologies in order to deliver a more effective solution that is easier for staff to use,” he said. “It doesn’t have to be an either-or situation.